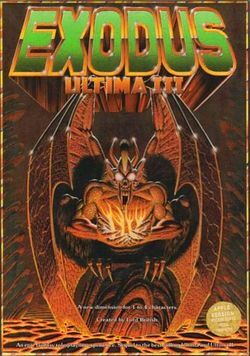 Ultima III: Exodus is the third game in the Ultima series series. Exodus is also the name of the game's principal antagonist. 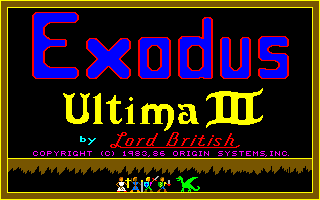 Released in 1983, it was the first Ultima game published by Origin Systems. Exodus features revolutionary graphics for its time, being the first computer RPG to display animated characters. Also, Exodus differs from previous games in that players now direct the actions of a party of four characters rather than just one. Players now battle groups of enemies on a separate battle screen, where the player has to understand weapons and magic systems and employ rudimentary tactics in order to overcome each opponent, as opposed to the system in the previous two games, in which the player is simply depicted as trading blows with one opponent on the world surface until either is defeated. Unlike the two previous Ultima games which had wire-frame first-person dungeons, Exodus' dungeons are solid-3D in appearance, integrated into the game's plot. Most of the futuristic aspects of the game seen in the previous installments are gone, including flying vehicles, time machines and spaceships. By denying the player the ability to see what's behind mountain peaks, forests, and walls, the areas can now contain many small surprises such as hidden treasure, secret paths and out-of-the-way informants. The look of the game is no longer based on certain characteristics of the Apple II hardware; it is rather a carefully designed screen layout. 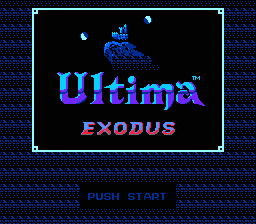 After Ultima II: The Revenge of the Enchantress, which was set on Earth, the story of Exodus centers on a quest back in Sosaria, the world of Ultima I: The First Age of Darkness. The player's mission is to destroy the final remnant of the evil Mondain and Minax. The game is named for its chief villain, Exodus, a demonic creation of Minax and Mondain that the series later describes as neither human nor machine. At the beginning of the game, Exodus is terrorizing the land of Sosaria from his stronghold on the Isle of Fire (known as Fire Island in Ultima Online). The player character is summoned by Lord British to defeat Exodus and embarks on a quest that takes him to the lost land of Ambrosia, to the depths of the dungeons of Sosaria to receive powerful magical branding marks, to find the mysterious Time Lord, and finally to the Isle of Fire itself to confront Exodus in his lair. The game ends immediately upon Exodus' defeat; unlike many games in the genre, Exodus cannot simply be killed in battle by a strong party of adventurers, but only through clever puzzle-solving and by paying attention to the many clues given throughout the game. At the end of the game, players were instructed to "REPORT THY VICTORY!" to Origin. Those who did so received a certificate of completion autographed by Richard Garriott. Although this is the last game in the series to take place in Old Sosaria, places in the game such as Ambrosia and the Isle of Fire make cameo appearances in later games, namely Ultima VII. Others: freeware conversion for the Game Boy Color, shareware conversion for the Macintosh by Lairware. This page was last edited on 20 February 2018, at 16:29.